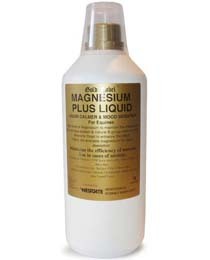 Magnesium Plus - Liquid calmer and mood modifier. A high level of magnesium to maintain the integrity of the nervous system and natural B group vitamins from Brewers Yeast to enhance the effect. Highly bio-available magnesium for rapid absorption. There are currently no questions for Gold Label Magnesium Plus for Horses - be the first to ask one!